Last night, I went to go see the Quarteto Nuevo at Cal State Fullerton. This is a chamber jazz (!!) group, and they play everything from traditional chamber music, to traditional jazz and even a lot of world music. I loved it. There was a soprano saxophone player, an acoustic guitarist, a percussionist that played a Peruvian drum along with several other percussion instruments, and a cellist. The sax player is actually on staff at Cal State Fullerton, and the best part was that they collaborated with a dance group from Fullerton – and my oldest was one of the dancers. I’ve seen Heather dance thousands of times, but I have to say that last night’s performance was one of my favorite pieces. The name of the piece was called “Women’s Dance”, and the whole idea was about how women support one another. When I thought about writing this post, I was going to focus on the ideas of improvisation and trust. But, that whole “women supporting women” thing seems far more timely! I’ve written this blog for seven years and five months now. Yes, I’m counting. Amanda and I have seen the blog go from being unnoticed, to getting a lot of praise, to people openly hating it (and us), and now we’re at a point where we have a lot of readers, many of whom remain silent. Make no mistake, I accept full responsibility for the road the blog has taken. These things didn’t happen “to” me, they happened as a result of what I’ve written or the expectations that people have had of our writing. I’m not apologizing, and I’m not disappointed. What I am though, is fascinated. You all have to know that this fandom is weird. It’s bizarre enough to attract a few people to write about it. We’re unique because for the most part, this has always been a female-dominated fandom. Most of us have been fans since childhood. Plenty of us, myself included, can count one (or more) of the band members as our first crushes. The emotionality that goes along with those pubescent dreams tends to fuel a devotion that spans decades. That loyalty is not only crushing to outsiders, but on occasion, it pulverizes other fans that happen to be in the way. We women can be very territorial, and we’re punishing to those we believe to be trespassing. My argument is simple: there are only five band members. Only the elite few have even the remotest chance of being accepted into that precious inner circle (this is not to be confused with having a shot at a one-nighter). Rather than giving a hand up to our fellow fan, many see this as competition, and push one another down. I see the comment “If I can’t have him, no one can” quite often. Truth be told, pretty much none of us can have any of them. We’re just hurting ourselves in the process of figuring that out. Instead of seeing fandom as an opportunity to find friendship, many times we’re looking for ways we can shove each other out of the way. That might have been fine when we were thirteen and not very wise, but now? What are we really doing to ourselves? We’re judging. We’re openly promoting ourselves on social media. We’re flaunting our feathers, hoping for attention from males who, quite honestly – have no interest in most of us. Funny how amongst many in the animal world – it is the males doing the flaunting. Maybe, just maybe…we’ve been doing it all wrong. The band is married to, or are dating models and people who have already figured out how to carve a unique path for themselves in this world. I’m not saying we have no chance at that, but let’s get serious…most of us don’t. Yet we judge. We mock. We take any opportunity possible to make sure that the few who might be sticking their neck out a smidge farther to be seen know that they don’t really matter. Instead of supporting one another and giving a hand up, we’re pushing one another down. When will we learn our lesson? During a time when the #MeToo movement seems to be plowing full steam ahead, I find that our fan community is nearly the antithesis. Last night, I watched Heather dance with her group. They twirled in circles, hand out, heart open in celebration of one another. I’d never seen anything quite like it, in many aspects. They grasped other dancers, lifting them joyously with one step, and then being lifted themselves in the next. It is a piece that will stay in my thoughts for a long time. Once upon a time, Amanda and I had a link page on this site. We wanted to create a sense of community, and yeah – we felt like we bloggers and website owners needed to stick together. Over time, sites went down, blogs closed, and the links were stale or broken. Rather than work to fix it, I took the entire thing down. I think it’s time I work to get it back working. Daily Duranie is a place of inclusion, and to not have a link page says something far different. If you’ve got a website and want to participate in a link exchange, let me know. I was beginning to do some cleaning the other day when I ran across my Seven and the Ragged Tiger album. That’s not really surprising, because I still prefer to listen to vinyl when I have the opportunity, and back in the day, this album was probably my favorite. On this day in 1984, Seven and the Ragged Tiger went platinum. I don’t know that I ever really thought much about that at the time, but I do remember that nearly everyone I knew had a copy. The slanted DD logo, the design featuring the eye in the middle of the compass/sunburst, the crescent moon and star, the “7” symbol near the right corner, and the photo on the front seemed to be everywhere, from t-shirts and pins to carefully sketched drawings on school folders. I spent hours scouring the album, trying to decipher the map on the back as though it coded with specific directions for fans (I’m still not entirely convinced there’s not a hidden message in there somewhere). My friends and I knew every single word to every song (probably not unlike those of you reading), and we painstakingly studied each line of lyric as though it were classic prose. If only I’d taken that kind of time with my eighth grade English class…. I know that today, Seven and the Ragged Tiger tends to take a lot of heat from die-hard fans who have now grown up and decided that the album isn’t nearly as good as we once thought. I read a lot about how over-produced it might have been. The space between the notes that Simon talks about enjoying on Paper Gods is pretty non-existent on SATRT. I too, recognize that perhaps the album wasn’t as mind-blowingly perfect as I once thought at the age of thirteen. I can say that about a lot of music I liked then, though. For me, my love of Seven and the Ragged Tiger isn’t solely about the album itself. The memories I have of that time help to continually elevate the album to superstardom in my head. I loved being a Duranie, and this one album, likely above all others, illustrates that time. I don’t know about anyone else, but I still get the silliest grin when I hear “New Moon on Monday” or “I Take the Dice”. That’s really all I need in order to tell me that Seven and the Ragged Tiger is still worth its weight in platinum, and then some. I could probably just post this picture and be done with the blog for today, because it probably says everything (and much, much, more) than I’m about to say anyway. I am consciously reminding myself that sometimes, the toughest blogs to write turn out to be the ones most needing to be read. Yes, I went to some shows this weekend, and yes, I had a fantastic time. I am so grateful that I had the chance to go and be with friends. So, while I was basking in the sheer glory of being up front, screaming for one of my favorite people on the planet, a friend took the photo. I (OBVIOUSLY) had no idea it was being taken at the time. I’m not so sure I love my face, but I see the sheer joy. It’s kind of hard to miss, really. I pride myself on being pretty low-key. (HA!) I have a great time at the shows, but I also recognize that the band are indeed real people. Being on stage is part of their job, in the same way that wrangling young children during recess and lunch is mine. I don’t have children screaming for me at work (but I do have a few that are insistent about coming to visit me nearly every day for tummy aches or to apply band-aids to non-visible “injuries”). In the same respect, once the show is over, I typically don’t bother the band. Yeah, I’ve ended up at the same bar once or twice, but other than that – I expect them to resume their normal lives. My students don’t come to my house and wait out front for me, and I try to be the same way with the band. I get it. It’s a job. Since Dom is the lucky guy in this photo (which btw was taken by my friend Suzie at the “breast show ever”….just go with it and don’t ask…), he’s part of the example here. As much as I love this photo, I also struggle with it. I tweeted it out, but stopped short of tweeting it directly to Dom. I wanted to share it with him because it’s both hilarious and really kind of sweet at the same time, but I just couldn’t. Why? On one hand, if you really need an explanation of fandom, it is all right there in that shot. I suppose that yeah, you could look at that photo and see all the craziness you want. Context is important here, because at the time Dom was playing the guitar solo for White Lines, and he knows that I love that song live. I smiled at him when he started it, and he came right over to me, and this picture was taken just before he bent down to play. He does an excellent job, and I was screaming for him. I’m proud of his work, and I’m not shy about that. I was also in the front, and I was thrilled to be there. I had so much love and joy flowing through me in that moment, and this picture captured all of that. 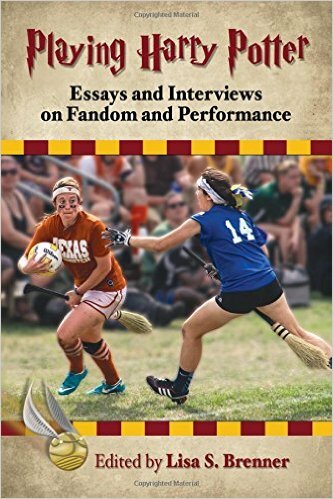 On the other hand, and this is the part I have a rough time with – I almost hate using the word “fan” because it immediately puts me on the crazy train. Since when did the word “fan” make me so damn self-conscious? Here I am, writing a fan blog, and I’m worried about someone thinking I’m a fan? There are so many different directions I can take this post from here. The path that seems most relevant is simply to say that we fans, collectively speaking, have been equated with the word “crazy” for so long now, that at times it is painful to admit that I am, indeed, a fan. I’ve been a Duran Duran fan since I was ten. I don’t remember life much before being a fan. Yet everywhere I go, particularly when at shows, all I hear is the word, “crazy”. If that’s not enough, we even admonish one another while we’re at the shows! The word surrounds us and it is never-ending. Even I’m starting to buy into the hype. Since when did being a fan become a bad thing?? Pictures don’t lie – when I look at that picture of Dom, the girl at the bottom is a FAN. That girl is me, yet it’s the last thing I want to be known for. It’s silly because of course I’m more than a fan. I’m Rhonda. I write. I am smart. I play a couple of instruments. I have three amazing kids. My life is pretty damn full, and I have feelings. I refuse to be just another face in the crowd. When I get up the nerve to walk up and say hi to a band member (or anybody for that matter) in a hallway and even get a hug, the last thing I want for that person to think is that I’m just another crazy fan who won’t let them go up to their room. Yet, in the back of my mind – that is always my worry. This blog aside, of course. Because yeah, it IS pretty crazy that I’ve written a fan blog for 78 months now. (That’s six and a half years for those of us who don’t love math.) Someday I’m going to switch the name of this to Daily Duranie Rehab and we can call it group therapy! The relationship we have with our idols and other people we care about is complicated at best. (I have a tough time calling Dom my idol, I have to be honest. I didn’t grow up with him on my posters, or worshipping the ground he walked on in the same way I did the rest of the band. It isn’t the same.) Impossible at worst. Not everyone gets to have their moment, even fewer become true friends, but somehow – those of us who have been around awhile get called “crazy”, and it’s unfortunately a term that has wrapped itself around my core. Sure, we can say we don’t care what other people think, but what about what WE think about ourselves? Yesterday was Thanksgiving at my house. Actually, that was the second time we celebrated—on Sunday, we were at my sister-in-law’s home with her side of the family. We’re celebrating early because we’re going to Paso Robles for the weekend, and I’m excited because all three of the kids are going with us. Sunday was lovely, but my oldest, Heather, had told us she wouldn’t be there. She was on campus, working backstage as part of the crew for a show. It is part of the requirements for her major and requires a lot of time, including striking the stage, which was happening that night. We’d agreed as a family to then have our Thanksgiving yesterday when Heather could be at home. We had just finished our meal on Sunday and were talking with family when the doorbell to my sister-in-law’s home rang, and someone shouted out “It’s Heather!” I was in the living room and heard the commotion at the door, and thought to myself, “Who’s Heather? !” Then I saw the long brown hair and knew. She’d gotten off much earlier than expected and came as a surprise. It’s ridiculous really, because Heather lives just a half hour from me and I have seen her, although since the beginning of October she hasn’t been able to come home and stay, but I was still overjoyed. Lately, I feel that way about Duran Duran, too. I wrote the blog, went to a lot of shows, and while they were all fun, I’m not sure I actually appreciated them. I mean, of course I loved seeing the band play, or hearing new music or seeing a new video. The only way I can explain myself, is to say that at some point, I stopped really listening for enjoyment. Weird words to use, maybe, but they’re truthful. I can remember back to when I saw Duran Duran in Costa Mesa in 2003, or several weeks later when I saw them at 4th and B in downtown San Diego. I was so excited at the mere thought of being in the same breathing space that I couldn’t sleep the night before. I listened to their albums here at home, in the car, whenever I could. I think my mind would be on them (leading up to a show) so much that I’d dream about running into them somewhere crazy, like at a gas station! Somewhere along the line though, that stopped. It is similar to when I bought annual passes to Disneyland when my kids were little (and the passes weren’t so darn expensive!). It was great at first, but it got to a point when Walt and I would tell Gavin and Heather that we were going to the park for the day and they’d complain. (Yes, complain. I mean, who wants to go to Disneyland when you can stay at home and play video games, right??) That was the last year we bought passes, I might add. Don’t get me wrong, I never complained about seeing the band. That would be monumentally stupid since I was the one buying the tickets! Nobody forced me to go, and I always had a blast. I just think the idea of going to show after show lost a little of that magic, and I did it to myself, really. I started comparing venue to venue or being more annoyed by the silly, trivial things about going to shows. I stopped listening to Duran Duran in the car. I certainly never listened to them here at home. I didn’t watch their videos very much, or if I did – it was solely for blogging or researching. In a sentence: it stopped being fun. I felt it happen. I think a lot of you probably saw it happen through my writing. Instead of being fun, it felt like a job. That isn’t how this is supposed to work. I didn’t know how to turn it all around, until I had no other choice. You see, as so many have rightfully pointed out to me, touring is expensive. I’ve recently had to get real and cut back on my expenses. I stopped writing and rewriting a manuscript Amanda and I had been working on because the last one that seemed like it had a good shot was rejected. After putting so much hard work into it, I had to stop. My brain was tired and I was emotionally SPENT. I wasn’t even sure I could keep writing this blog. Then I got a job, and little by little – I was forced to put the blog and even my love for Duran Duran on the back-burner. I’ve been feeling this way since August for sure, but if I really think about it, I think I’ve probably had these sorts of feelings since before Paper Gods was released. Yesterday, I blogged about Notorious. As I was writing, I realized that I probably hadn’t listened to that album in years. Not the whole thing, and definitely not just for pleasure. I put it on. I finished blogging, and then set the table for Thanksgiving. I found myself singing along, not really deeply listening for every single guitar chord or synthesizer track – but just enjoying the music. I really enjoyed it. Two nights ago, I woke up after having a dream. I’d run into Simon somewhere and he took down my name because one of my shows had been canceled and he was going to help me out. (clearly a dream, right?) I haven’t had a dream about Duran Duran…or really ANY dream….in many months. Most importantly, I’m thinking about blogging again. Thinking about what I want to write. No, I’m not planning to see the band live any time soon, unless they come to the west coast again…but I feel like I’m enjoying being a fan again, and I’ll take that over a show any day. I suspect the next time I do see them, I’ll be far more appreciative. That isn’t about being Daily Duranie, or blogging, or trying to write a manuscript. It’s about just being me. A fan. On a day where precious little seems to be happening in the land of Duran, I’m lucky to have stumbled upon a news item worthy of discussion. Now, I realize that in the note he’s comparing Bruce Springsteen to God. I also recognize that for many readers, this is not a realistic, or even possible comparison, regardless of the reason. I’ll leave you all to debate that particular comparison or topic amongst yourselves, on your own forms of social media. Instead, it had me remembering the time I took my own daughter out of school to go meet Duran Duran in Hollywood. At the time, Heather was eight, and she was in third grade. I should also mention this was at the signing for Astronaut, which came out in 2004. I’ve written about meeting the band, but I don’t know how much I actually said about just being with Heather for the experience. (I may have written some along the way, so I apologize if you’re reading and thinking, “Get over it, Rhonda. Who cares?! ?” For the rest of you, this is new!) Not only was it Heather’s first time meeting Duran Duran, but it was mine too…and it was the only time either of us met them as a full group. There are moments that happen in life when only later while reflecting do you begin to recognize their significance. That night is one of those times for me. During this particular period in 2004, Heather was getting heavily involved in dance. It was a huge commitment for everyone because I could never go anywhere without considering who would get her to the studio and back home at night. In addition to the time commitment, I felt like I was really losing my daughter in a lot of ways. Rather than spending quality time with me, she was being taught by circumstance to consider the studio her home, dance teachers and classmates her family. I missed her, but I recognized that dance was her passion, even at the tender age of eight. In the meantime, I’d planned a Duran Duran fan convention in New Orleans, met new friends, got involved online, and basically branched out on my own, trying to find and get reacquainted with the person I was prior to being “mommy”. Along came the announcement of the signing. I wavered quite a bit before making the decision to go. Hollywood is a trek from my house (I almost never drive up there because I hate the traffic), it was during the middle of the week – twice – once to buy the album and get the wristband, another trip to actually meet the band for the signing, and I knew that trying to make the schedule work in between all of the other responsibilities I had was going to be impossible. As always, I hesitantly tested the waters with my husband. Back then, I was afraid to tell him about events with the band because I knew he didn’t get it, and I knew it would just cause problems. I hate to say it, but I was a pretty wimpy wife back then. I figured I’d mention it at dinner, get the proverbial eye-roll and look of disgust, and then let it go. So I remember very uncertainly commenting about it – just an offhanded, “So, Duran Duran is doing an album signing in Hollywood, can you believe that?” sort of thing. Back then we had a small round table we ate at in my kitchen, and I remember Heather getting so excited. She was overjoyed that mommy would finally get to meet Duran Duran. In her head, there wasn’t even a question whether I’d go, or whether I’d really get to meet them. I was really kind of surprised that she understood the significance at her age, but for whatever reason, she did. She really seemed to understand that for me, this was a once-in-a-lifetime kind of thing, and that I’d waited since I was ten. That kind of made Walt take notice when otherwise, I don’t think he would have spent two seconds even listening. Fandom of any kind isn’t his thing, so I didn’t have any grand designs about having any sort of understanding from him about meeting Duran Duran. Going to meet a band probably seemed like a gigantic waste of time to him. Heather spoke so animatedly about it, saying that she wanted to go with me and how much fun it would be. Walt looked at me and said, “Why don’t you go then?” I am pretty sure my jaw hit the table. So we went. It was one of the best experiences ever, and not just because I got to speak to Roger Taylor and tell him that he was my favorite band member and that I was so glad he came back. (Yes, I really did say those words. At least I didn’t tell him that I spent a good part of my days back when I was 12 waiting for him to show up on my doorstep realizing that I was the girl for him. I did have some good sense.) As exciting as it was to be so close to the band that I could tell Simon had seen the inside of a tanning booth at some point and that yes, Nick’s skin really was absolutely flawless…the best part was being there with Heather, and watching her see MY reaction. How many times do we really get that chance to share something from our own childhood with our children? I don’t mean just taking them to Disneyland or whatever amusement park you spent time as – I mean a real passion. Something that truly defined you, or made you who you really are underneath all of that “Mom” stuff? For me, Duran Duran is very much that “thing”. (I laugh ruefully here, because little did I know in 2004 just how much Duran Duran was about to play part in my life. Little did I know….) I kept sneaking glances at Heather as she looked around at all of the people we were waiting in line with, and watching her reactions as we’d talk about the band. There was no filtering my love (or anyone else’s) or exuberance for the band. She was experiencing my fandom exactly the way I would have shown it even if she hadn’t been there. She saw the good, the bad, and maybe even a bit of the ugly. But the best part for me was that it was something we experienced together. I shared a part of my deepest, and sometimes darkest, inner me with my daughter. And as a result, Heather has never once…not even a little…ever made fun of this blog or what it has become. Let’s face it, the blog is a pretty easy target. Upon first glance, one might think it’s a cute little love note, or marginalize it to just being a serious symptom of being a fanatic. Two grown women, writing a blog about a band?!? The jokes almost write themselves. I know this, and Amanda knows this. My family (mostly) thinks Daily Duranie is a waste of time, no matter what I share with them about our traffic or the sheer amount of people who thank us or recognize Amanda and I when we’re together at a Duran show. I’ve learned to keep the blog to myself and not share with the family, or if I do share – I just make light of it, because it’s easier than hoping for respect I’ll never get. Not Heather. For whatever reason, and I tend to think it’s because I shared a little bit of what makes me “tick” with her that night, she’s never once made fun. She encourages me, tells me to follow my heart, and does exactly for me as I do for her when it comes to her dreams. 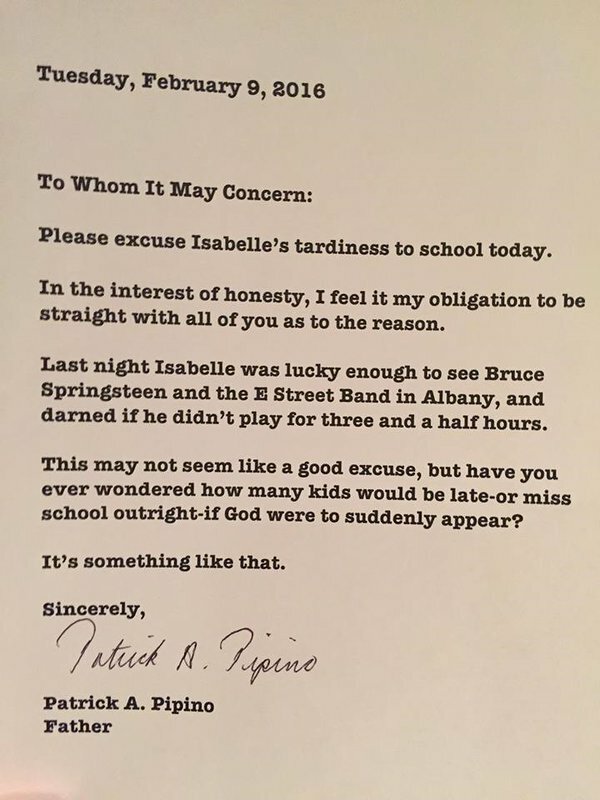 I don’t remember what I wrote on the note I gave to the school for her excuse. I’m pretty sure I didn’t say anything about standing in line for hours to get a wristband to see Duran Duran, though. I wish I had, because I think she learned as much about me that night as I did about her. The Duranie part of me has felt pretty weak lately. I haven’t been feeling very Duranie like. Is it because I have been working ten to twelve hour days, which doesn’t allow for a lot of fandom expression or focus? I’m sure that could be part of it. Could it be because we haven’t really seen or heard that much from the band for a LONG, LONG time? (Don’t criticize the messenger here, people, but it has been more than 2 years since the last real tour and more than 3 years since we had new music.) I find myself struggling to remember, at times, what the big deal is with Duran Duran or with me being a Duranie. Then, I thought…if I am feeling that way for whatever reason, am I the only one? (Again, don’t criticize here, people. You can’t be critical of emotion/feeling. I’m not liking how I have been feeling but it is what it is. Plus, stick with me. I promise that it will be worth it.) I can’t be the only one, right? My goodness, each and every day I do something related to Duran Duran and, yet, I’m still not feeling it that much. What would cure this illness?! Well, I’m sure a good show or performance might do the trick but I can’t just snap my fingers and make that happen for myself. I’m also sure that if DDHQ asked us to do some work for them that I would snap out of it. (HA! As if!) So, what’s the next best thing? I need to remember good times. The best times. I need to remember the best times I have ever had. I need to remember the best experiences I have had as a fan. I need this and my fandom needs this. Thus, I am proposing a challenge to myself. I will make myself think and list the ten best experiences I have had as a fan. Perhaps, these experiences will be a show or the first time I heard a song or saw a video. Maybe, it will be something to do with a band member or two. I suspect that tours will be featured heavily. My friends, no doubt, will be featured. They will be in my list, for sure. As I begin to think about the best experiences I have had as a fan, I’m already remembering that those best experiences don’t have to do directly with the band, necessarily. They are connected to the band, in some way, or in connection to being a fan, to being a Duranie. I need to think and remember that fandom is more than the band. It is about the activities I have been able to participate in and the experiences I have had along the way with the friends that I have made. I have been thinking a lot about change lately. More specifically, this year has been filled with a lot of change for me, personally. To make a long story short (because who wants to read about me! ), I have had two significant changes in my life. First, I bought a condo on the other side of the city. This was a big deal, not only because of the financial commitment, but also because I had been in my last place for over 10 years. I was definitely trying to shake things up. Second, I got a different job! While this job is still teaching, it is completely different from what I have been doing. I will be working with different curriculum at a different age group. These changes are ones that I embrace, ones that I look forward to. That said, as I adjust, I find myself looking for the constants in my life. So much has changed, what has stayed the same? 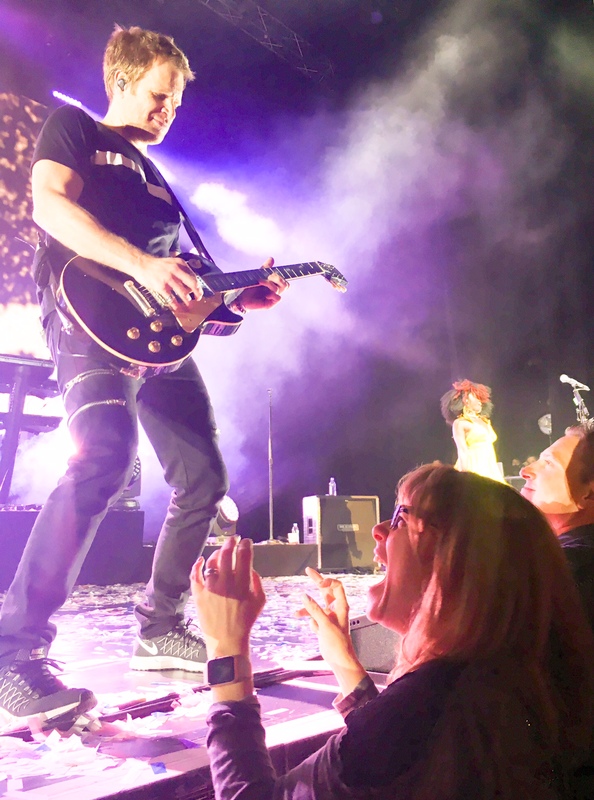 Since this is a blog about being a Duran Duran fan, you are probably not surprised that one of the big constants in my life is being a Duranie! This really hit me as I began packing all of my Duran related stuff. I began to ask myself, “Do I really have this much Duran stuff? Is it too much?” I even asked my dear friends on Facebook to guess how many boxes my Duran stuff filled up? Now, of course, box sizes vary wildly, the answers ranged from about 10 to about 45. The answer? 37. Now, before you all freak out and tell me that my obsession has gone too far, about 10 or so were shoe boxes. They were small. It is my excuse and I’m sticking to it!!! Now, I’m basically unpacked. I have a few areas that I would like to reorganize but there are no more boxes. Pictures and knick knacks have been strategically placed. Ah…more constants in my life. The last room in the condo to be completed is my office. I’m so excited for this space. In my old place, whenever I had work to do, it was on the dining room table. Piles appeared and organization was challenging. 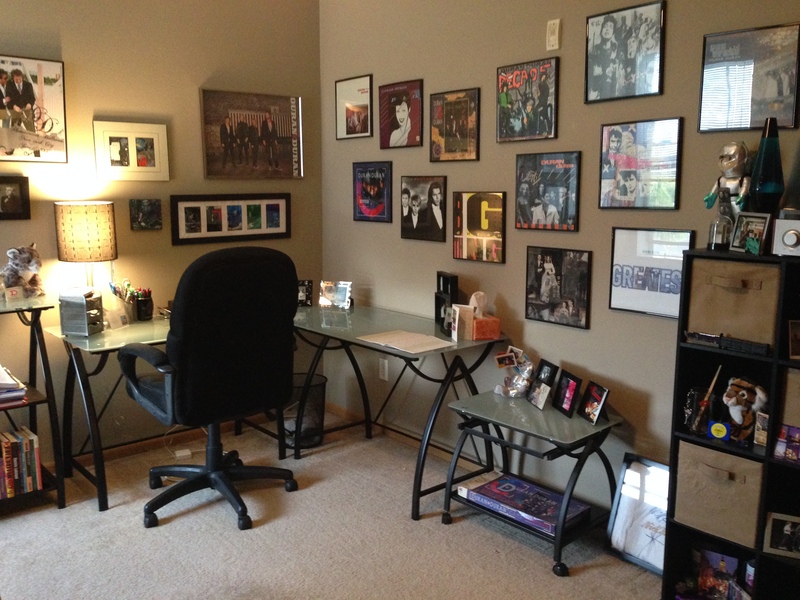 My new office offers me space to work, whether that work is part of my paid job or whether it is blogging, book writing or event planning as part of my fandom. 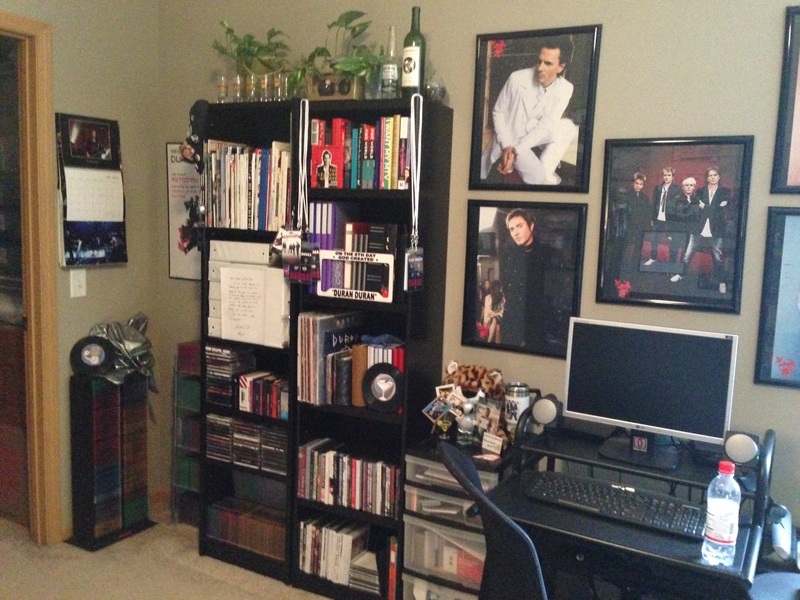 It probably isn’t surprising that my office is filled with all of the 37 boxes of Duran stuff. My office makes me feel warm. It is filled with objects that represent m emories and good times. The room reminds me that Duran Duran has been in my life for over 20 years. I’m glad that they have been a part of my life and the soundtrack to my life. My thoughts then shift to the band and them finishing DD14, the next Duran album. I wonder if they are embracing change with it? While I know how much of a good thing change can be, I also appreciate what has remained constant. I believe it is a delicate, but important balance. I have a feeling that somehow, I completely missed the February edition of the Katy Kafé with Nick. I don’t know how that happened, only that it did…and we’ll just leave it at that for now. My apologies. However, I’m back at it with for the March edition, and the guest in the Kafé this month was none other than Simon LeBon. As per usual, I am just going to do a summary of the highlights. If you really want to enjoy the Kafé, the best way is to get yourself a membership to duranduranmusic.com. He explains, I think, that Sphere Studios is no longer Sphere Studios. The owner apparently has another studio here in the LA area that will be called Sphere, so the occupants of the studios in Battersea are voting on a new name. Simon’s idea is to call it the Southern Sun Studios. This makes me laugh because well, “sun” isn’t necessarily the first thing that comes to mind when I think of London. Perhaps that’s the point, as Simon goes on to acknowledge that yes, it does bring the label of Elvis Presley “Sun Records” to mind. Katy takes this beautiful opportunity to once again try to pry some information out of LeBon…but he’s not playing along. I have to give Katy due credit, she really does try to get information out of him, or at least some sense of clarity. She realizes that to all of us out here – those of us who care, mind you – would really like to know what in the hell they’re doing in the studio each day. We want to know where they are as far as the album goes, and to be blunt – when are we gonna hear something new?! Katy makes the point that while John is saying the album will not be out until 2015, Nick is really still saying it will be a little earlier (at least he’s hopeful! )…and she asks Simon why there seems to be a disconnect. Simon doesn’t say a thing (seriously, there was dead silence in the Kafé at that point!) except to say that she should know by now he’s not going to give a single detail. Fine then, Simon. Don’t play nicely. I may just have to resort to posting photos and video of your dance moves over the years and we’ll start voting and judging them. That’s fine….I’m sure I can find plenty to keep me busy until one of you decides to spill the secret, or better yet…the album is released. Katy tries again, going for the “You know who we need in here? We need John Taylor” approach…because at least HE will give us some info. Except that according to Simon, they’re not sending John for interviews any longer. So the album is THAT secret?? You’d think they were afraid of a blog getting hold of all that precious and juicy information and misinformation, then spreading it throughout the internet, fan community and world… or something. Gee. Who’d really do that?!? Simon does say that he’s just finished playing some guitar on the song they’re currently working on , and says that the guitar is kind of a mix between The Cure and Johnny Cash. I can’t even imagine what that must sound like, and it appears I’ve got at least another nine months of wondering ahead of me. Yay. Additionally, he tells Katy that he spends some time tinkering with his motorcycle…thus begins a short discussion of Simon suggesting that anyone who works on cars, motorcycles, etc should wear surgical gloves. Not a bad tip. They’re cheap and can be thrown out when the job is done, although Simon slyly comments that he might sell his on eBay when he’s finished. (He was KIDDING so don’t even think of running an eBay search for them!!) I grimaced, knowing that while the idea of buying such things might be, well…odd to me…he’d probably get a good price for them. They continued on, speaking of British and American TV shows, accents and even books. Simon has been reading a lot of Stephen King as of late…(a future Simon’s reader author, maybe?? ), and interestingly enough, he even had dinner with Benedict Cumberbatch (Google him if you don’t know who it is) recently. Simon describes him as a very good person who is obsessed with film. I’d describe him as the perfect British actor (I adore his series, Sherlock)…and he has an open invitation to read stories to me any time he’d like. *coughs* Simon closes the Kafé by extending his condolences regarding L’Wren Scott to Mick Jagger. As abruptly as the Kafé began, it ended, and Simon was off for more work in the studio.